Interested in having the future of motorcycle front suspension on your next motorcycle model? We're here to help. Our engineers and designers have workedwith major Japanese and US motorcycle manufacturers and know what it takes to collaborate on complicated projects. Over the years we have developed various engineering computer models to ease the adaptation of our patented technology into any chassis design. 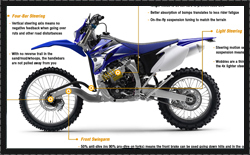 Our goal is simple: offer the benefits of our steering and front swingarm technologies to as many people as possible. We want to make it very easy and affordable for any manufacturer to consider using our patented technologies. Whether big or small we have a package that will work for you. So go ahead and reach out to us and see how simple it can be to include the future of motorcycle front suspensionon your next design. Looking for that little extra to beat the other guys? We have a variety of parts in stock to make your front swingarm conversion a reality. Smaller team can tap into our off-the-shelf parts and modify them at will to achieve the desired results. Bigger teams, we invite you to test a configuration of our chassis in parallel with your current setup to see for yourself the benefit of our technologies. We have high-end 3D scanners at our disposal to quickly scan your existing engine-transmission configuration and fit it into our race chassis design for a perfect fit.